Firefighters respond to wildfire near Whistler, B.C. Firefighters they are holding a wildfire in check at the base of Blackcomb Mountain in Whistler, B.C., after it flared up Sunday evening. 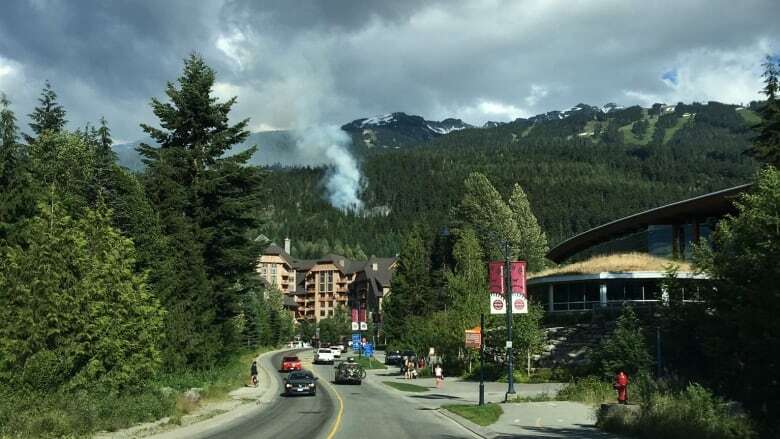 Firefighters say they are holding a one hectare fire that broke out at the base of Blackcomb Mountain in Whistler, B.C., in check. The B.C. Wildfire Service said it sent two helicopters, three crew members and an officer to the fire. An air tanker was requested, while snow-making machines from Whistler Blackcomb were also used to combat the blaze. B.C. Wildfire Service spokesperson Marg Drysdale said the fire was likely caused by people, since there haven't been any reports of lightning in the area. Whistler Fire Rescue Service also responded to the blaze. Riley Senft said the fire broke out about a kilometre from his cabin. Senft said he first noticed it when he stepped out to the recycling depot Sunday evening at about 5 p.m. PT, with his son. "On the way back we could see smoke coming out and a bunch of helicopters around," he said, adding that the fire did not appear to be spreading toward his home. Drysdale said that as of 10 p.m. PT, the fire was being held, which is one step before being under control. She said the fire is at least 400 metres from any structures, but not threatening them.